Remote. Unspoiled. Breathtaking. With words like that used to describe Iceland’s north-west corner, known as the Iceland Westfjords, how could we not spend time in this true Icelandic wilderness? The Westfjords are teeming with wildlife – seabirds, seals, whales, and other marine mammals. There couldn’t be a better way to get up close to the wildlife than to do some paddling. How many seals do you count? Locals always know the best spots and the team at the family run Borea Adventures were happy to share a few of Iceland’s best kept secrets with us as we tried out a new kayaking day tour they’ll be adding to their offerings for the upcoming season. Borea Adventures is located in the heart of Ísafjörður and we met our guide, Örvar, there. We’d be driving out to Hestfjörður, the narrow steep-walled fjords known as the Horse Fjord. It’s one of the best places in Iceland where you’re almost guaranteed to see seals. As we launched our kayaks out in to the water, the seals all took a dive. Curious critters that they are, at least 20 heads would pop up craning for a better look at us. The seals were just as interested in us as we were in them and as we paddled out, they’d pop up right next to us to see what we were up to. The seals continued to pop-up and dive around us as we paddled out toward Vigur Island. The water was nearly like glass, making it easy to spot them. We kept our eyes peeled for any whale spouts or fins. Though we never did spot any whales, like the humpbacks that like to come in to the fjord, some harbour porpoise did give us a show. They are the smallest marine mammal and look a bit like dolphins. Vigur Island is a small island in the Westfjords known as the “Spear Island” because of its shape. Once upon a time, four families lived and farmed there. Now just one farmer remains. He is the fourth generation to inherit and live on Vigur Island and once we paddled ashore, we could immediately see why he enjoys living there so much. The 360-degree views are simply spectacular! All that paddling makes even the heartiest explorer famished. Örvar’s family also runs a small cafe and his brother had packed each of us a lunch bag. Everything is homemade and is both organic and local. The cafe bakes the bread for the sandwiches and the tomatoes and cheese come from a farmer in town. We also enjoyed fresh baked muffins and granola bars. Seriously the best granola bars we’ve ever had! His mother keeps the recipe a secret, even from Örvar. He joked with us that to work in the cafe you must sign a non-disclosure agreement before you get to help make the granola bars. Fueled up on a healthy and delicious lunch, we set out to explore Vigur Island. In July and August all sorts of sea birds, like puffin, come to the island to nest and raise their young. We’d missed them leaving by only about two weeks, but the Eider ducks call the island home year round. The farmer makes a nice nesting area for them and slowly “steals” their feathers all summer long. He produces the expensive and luxe Eiderdown from the feathers collected in the small factory on the island. But not to worry, he replaces what he steals with hay and the Eider ducks are perfectly happy. Bring your credit card and you can go home with a very nice Eiderdown quilt, though it might cost you more than your flight to Iceland. Vigur Island is also home to Iceland’s only windmill. It was built in 1840 and used to grind grains. It was really ingenious when it was built – the whole thing turns so that it could always catch the wind no matter which direction it was blowing. It’s no longer used, but it is quite picturesque. You can even mail a postcard with a special stamp made only for Vigur Island from the tiny Post Office. It’s the smallest Post Office in Europe. The island is home to around 30 sheep, though the main livelihood is the production of the Eiderdown. Stroll around the “highlands” of the island and you’ll run into the sheep munching away on the grass. You can also walk down to the beach and have a look at the “face” rocks. Icelanders believe in trolls and elves and Örvar points out that this rock looks like a head with a big nose sticking out, eyes, and like the troll even has hair. The walk around the island is perfect to stretch your legs before hopping back in to the kayak to paddle back across to the fjord. 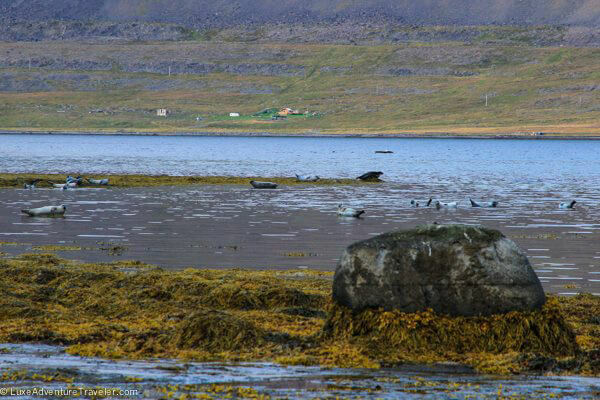 The Vigur Island and Seals kayak tour is available from May – September. 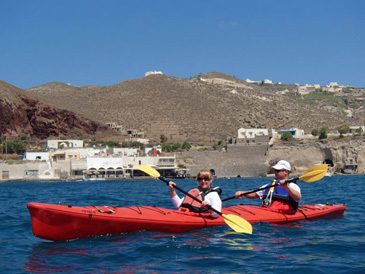 Inquire with Borea Adventures and check out their other tours from kayaking to skiing. Paddling to Vigur Island is 10km (6.2 miles) round trip. Wear warm water repellant clothing and socks. A dry suit and life jacket are provided to go over your clothing. Our Vigur Island kayak tour was hosted by Borea Adventures in order to bring you this story. As always, all opinions are entirely our own. Sounds like a great day out Jennifer, almost a fantasy – the lone farmer who sells eiderdown, the last windmill, Europe’s smallest post office and a troll in the cliffs – and the food sounds sublime. Next time we’ll be in Iceland we won’t miss this experience. Love it! Wow, what an adventure! The scenery there is just gorgeous! Though I’d probably drop my oar if any marine animals surfaced to close to my kayak LOL! Wow Jennifer, I had the same experience last year in Iceland too! So glad to see your post, it’s like living that experience again, although not with as good pics as yours! This is amazing! 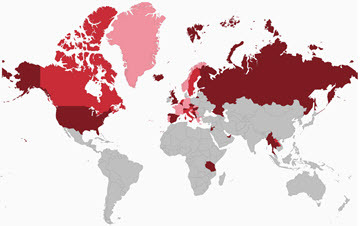 Seems like I’m hearing about Iceland everywhere I look these days… definitely fueling the fire to get out there! Iceland has been a dream and then now, kayaking in this scenery. You are so lucky! Kayaking with the seals sounds like so much fun and I would love to see a puffin! The kayaking sounds like it was idyllic. Have cool to have had the company of seals popping in and out. I’ve never been to Iceland and it’s been on my top list of places to visit for some time. Reading this and seeing the beautiful scenery makes me want to book the next flight out immediately 🙂 I’ll get there soon enough and when I do visiting the Iceland Westfjords will be on that list! Great article. Gorgeous post! I love the blue color of Iceland’s only windmill. I definitely need to re-visit Iceland. Kayaking through the westfjords looks like a dream come true. What a fun adventure! 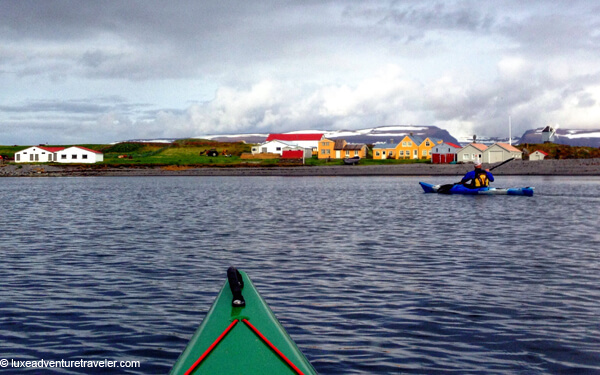 We loved the Westfjords and kayaking is always one of our favorite things to do. We will have to check this out on our next visit. That’s too bad you didn’t see humpbacks but glad you found some harbour porpoise–sounds like a great paddle either way though! I absolutely love Iceland and need to go back to explore it a bit more. Definitely adding some kayaking to my “to do” list! I would love to visit Iceland one day. I heard saw many amazing photos of it. It looks like a truly magical country. Kayaking with seals must have been such an amazing experience. Was it freezing being out on the water kayaking? Your photos are stunning, and I do love to kayak! No, actually we were hot. It was a nice, sunny day and you wear a drysuit. Without being in the water in a drysuit, it’s like wearing a thermal sleeping bag and trying to do physical activity.